Dan Norgard and Rachel Phipps have been teaching together since 2013. Their classes and workshops explore a balancing act of the physical and emotional self through body awareness, trust, communication and confidence. Whether you are involved in sports, yoga, or are exploring new areas of movement, AcroYoga is a powerful tool for transformation. AcroYoga will push you past your edge and exceed your limits of exploration and enjoyment both through individual success and partner dynamics. 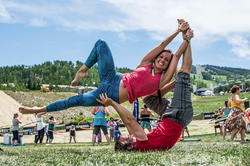 Beyond their weekly classes, Dan and Rachel have brought the art of flight to local festivals such as cOMmon Grounds Festival, Yoga Rocks the Park and Yoga Camp. They also host numerous works shops and series throughout the Twin Cities. This class will cover the fundamentals of flying, basing and spotting. Anyone can do Acro! This workshop is designed for beginners who want to learn partner yoga, so no experience needed! You will work in groups as you build your skills from the ground up, so no partner needed. Students will learn body awareness, trust, communication and confidence all while gaining improved strength, balance and flexibility.